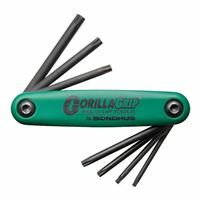 GorillaGrip fold up sets are compact, easy fitting into pockets or toolboxes. The fold-up handle is 40% stronger than steel handles and are color-coded for easy identification. Features ProGuard Finish which is 5 times more effective than the leading brand in preventing rust. Includes tamper resistant star sizes TR7, TR8, TR9, TR10, TR15, TR20, and TR25.